Η Disney κατασκευάζει με 3d printing μαλακά ρομπότ με αισθητήρες αφής! Disney has filed a patent for a 3D printed “soft body robot” that is suitable for “physical interaction with humans.” The patent says that Disney has already built a small, human-like prototype based on a popular Disney character. If you’ve ever visited one of Disney’s famous amusement parks, you’ve almost certainly wondered about the people underneath those giant furry costumes: Disney World, Disneyland, and other Disney parks are all populated with hordes of their popular children’s characters—Mickey Mouse, Donald Duck, Goofy, and the like—all played with relentless enthusiasm and grace by a human hidden underneath. For better or worse, that incredibly unusual profession could soon be under threat, because Disney has filed a patent for a 3D printed soft body robot that can interact with children, giving out human-like hugs and greetings in crowds. The patent hints at a plan to introduce humanoid robots at Disney theme parks, as it strongly emphasizes the importance of a child’s safety. “To physically interact with children, the inventors understood that the robot should be soft and durable,” the patent states. Although the patent suggests several ways in which the robot could be built, there is a strong focus on the 3D printing technologies that could be used to produce various components. Links, joints, bearings, and body segments could all be 3D printed, says the patent, while a Stratasys Objet260 Connex multi-material 3D printer has already been used to 3D print a prototype soft robot. This 3D printed prototype robot is a “small, toy-sized” machine that appears to be based on the Baymax robot from Big Hero 6, though the patent refrains from mentioning particular movies and characters by name. “This robot’s style and other motions…were modeled after a given animated character (e.g., a character from an animated film or television show),” the patent says. Disney’s soft robots would, according to the patent, be partially filled with air. With the inclusion of various sensors, this would allow the robots to react to pressure, giving natural-feeling “hugs” to humans, as well as giving them the ability to perform other actions. While these motions could eventually be carried out autonomously, the patent mentions that a “controller” would initially handle the task: “During operations, the robot controller operates the joint based on the pressure sensed by the pressure sensor,” it says. Would you feel comfortable having your child greeted (and embraced) by a robot? Countless sci-fi movies and television series have warned us to be on our guard about such things, but perhaps this is exactly the kind of up-to-date entertainment that Disney needs in its theme parks right now. 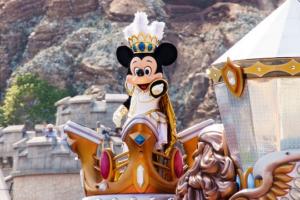 And while the filing of the patent does not necessarily indicate that Disney is pressing ahead with the idea, the existence of a 3D printed prototype could be a sign that soft body robots are well and truly on the table for the entertainment giant.